You know, it’s been a few weeks since I reviewed something I really, really enjoyed and could unabashedly recommend without hesitation. We’ve been bopping around the 4-7 spectrum for a while on these ratings, and I feel that you deserve a better class of comic book. Yeah, I’m going to the well of comics I’ve already read for you this week (and read several times, for that matter), not only because I want some straight up power of positivity, but mostly because the construction of additional townhouses that is going on right outside my window is making reading with any level of comprehension a nightmare. I mean, how many times can I read the same page? Oh my god, just BANG BANG BANG from out my window all the time anymore. Sheesh. Well where was I? Right, Deadpool: The Complete [Daniel Way] Collection (volume 2)! 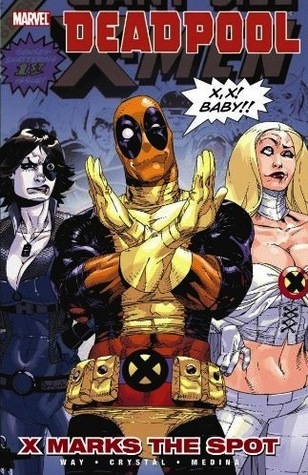 This series divides a lot of people down the middle, but I actually loved Way’s Deadpool. People gave it crap for making DP a little TOO zany and looney, but he’s already an absurdist character as it is. And while I believe, sure… there is a line even for the Merc With A Mouth that shouldn’t be rushed over, I don’t think this series ever goes all the Way over it (Oof, sorry for that one). I chose volume 2 because out of the four collected editions of Daniel Way’s run, I think it’s of the highest quality overall. Volume two is pretty much guest-star city, with storyline after guest-star storyline, allowing DP to play his trademark crazy off of a lot of different Marvel characters. 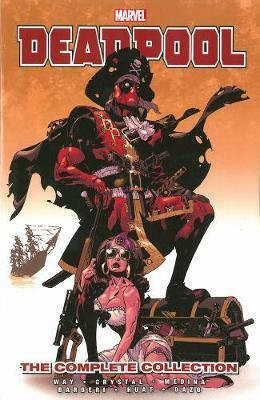 There are some non-guest-star-enhanced tales in this one, most notably an arc that sees Wade run into his old “buddy” Weasel in Las Vegas where the latter has developed a power armor suit and is defending the Strip, and the last story of the volume that sees DP taking on a horde of vampires (or Draculas, as he calls them). But the interaction of Wade and the disparate corners of the Marvel Universe are the high points. The first such meeting comes when Deadpool washes up in San Francisco after an interlude as a pirate and feels that the X-Men’s establishment of a safe haven known as Utopia is calling out to him. In this arc—titled Want You To Want Me–Cyclops categorically rejects ‘Pool’s request, but Wade is undeterred. When the absentee father of one of the students at Utopia takes to the airwaves to demand contact with his daughter—at Norman Osborn’s behest because this all occurred during Dark Reign–Deadpool decides it is a fantastic opportunity to show Cyclops his moves. It gets a little convoluted from there—If there’s a knock to be put on Way’s run, it’s that he has a consistent habit of rehashing a trope where DP seems idiotically out of his league, only to ultimately reveal he had planned everything to a tee from the start—but Wade outs the father in the media as a puppet of Osborn’s, and Cyclops sends him on his way… after admitting that DP has some moves. There’s fun all over this one, from finding out Domino has a crippling fear of chickens to Deadpool showing up in a self-styled X-Men costume to kill a man on TV. Most of Deadpool’s direct interactions here are with Domino, and they make a really fun pair. The next great guest appearance story is the succeeding story arc, Whatever A Spider Can, where Wade teams up with, obviously, Black Widow. Oh wait, jumped the gun a bit there. In this one, he partners with Spider-Man. After Spidey mistakenly accuses Deadpool when an assassin takes out a deli owner, the two join forces to find the real killer, the simian assassin called Hit-Monkey. For as good of a duo as ‘Pool and Domino make, Wade and Peter Parker practically write themselves (which is no doubt why Marvel brought legendary Deadpool scribe Joe Kelly back this year to pen a book about the two of them). Spidey’s exasperation at having to deal with someone as frustrating to him as he is to everyone else is glorious, because he so seldom gets to play the straight man to another character’s shenanigans. Hit-Monkey as a concept is… well, it is what it is. It’s ridiculous in an entertaining way that just makes sense in the Marvel Universe, but some stuff is left unexplained. Why are women drawn to him? Did Way get him confused with Mandrill for that scene (in a dance club where women find Hit-Monkey irresistible)? Why is Hit-Monkey after Deadpool? Is it a contract, or is he just getting rid of the competition? You know… I’m probably putting way too much contemplation into a character called “Hit-Monkey”. Anyway, Deadpool wears a dress, Spider-Man dies, and Hit-Monkey’s attempt on DP’s life is eventually thwarted. After a few interlude tales (Deadpool fights some hillbillies, gets attacked by Ghost Rider, and then gets a job as muscle for a Las Vegas casino with Weasel), the Merc with a Mouth next finds himself meeting Captain America and his Secret Avengers, Black Widow (see?) and Moon Knight for a storyline called I’m Your Man. The villain of this story is Dr. friggin’ Bong, who I have not seen since She-Hulk #5, WAAAY back in ‘89. I’m sure he’s popped up once or twice since then (actually, I’m NOT sure of that. It is Dr. Bong, after all), but it was a blast from the past for me. (*Okay, before anyone gets to it in the comments, I checked. According to Wikipedia, this actually was Bong’s first appearance since that She-Hulk comic. I’ll be damned. Hey, in addition to questioning the motivations of a plugger primate, I’m now spending a lot of time mulling the appearance history of Dr. Bong. I’ve made some weird life choices). This one’s got clones of the heroes running around, an Arab-American who may or may not be a terrorist, and celebratory fireworks. Like the previous two arcs, it’s the interplay that works here, as the straight-laced and high-strung Steve Rogers has to deal with DP’s inaneness. The highlight of which is absolutely seeing Steve volunteer to sit on Wade’s lap in a crowded sedan. +It’s a shame the art in is not consistent across the series because when Paco Medina (the semi-regular artist of the run) is on it, the quality is top-tier and just so damn fitting. Medina just seems to get Deadpool. There are influences of Ed McGuinness to be sure, but it’s also a style all his own. Great facial expressions, fantastic details (such as seeing DP’s facial movements beneath his mask), and amusing visual comedy bits. +What can I say? This book is genuinely funny. ‘Pool is a fun character, and Way creates some brilliant scenarios to maximize his potential. I’ve read most of Way’s run several times because it’s so damn humorous and hasn’t gotten old for me yet. -The run as a whole (63 issues) does tend to get worse as it goes on. There is a lot of build on Deadpool’s obsession with death and by the last volume of Way’s run, it becomes the entire point of the book and it’s a bit played-out by then. Deadpool drifts away from silly and fun and into self-loathing just a bit too much. -Way reruns a lot of ideas through his stretch. As I noted before, there’s a lot—A LOT—of Wade playing the fool only to reveal he was manipulating everyone the whole time. There’s repetition on the use of flashbacks in that regard to show the moments where Wade starts figuring everyone out. It’s not exactly awful, but it gets to the point where you see all the turns in a story arc coming a mile away. Yeah, no matter what anyone says, Daniel Way’s run on Deadpool remains a highlight for me. It’s got great humor, great art (mostly…), and a lot of fun interaction with the rest of the Marvel Universe. Yeah, the series gets less entertaining as it goes on, but it stays worthwhile for a while before it gets too bogged down.